Today’s post is going to be a little different from our normal posts. Today, we are going to go back to the beginning!! Recently I’ve been thinking a lot about my roots and about where my inspiration comes from, and I decided that I wanted to take you all back… back to the beginning! My husband and I (along with my son) moved to this small town in 2011, and because of that my husband decided to start a project related to recycling. I fell in love with the city from the very first moment I set my eyes on it. Everything captivated me, the waterfalls, the mountains, but especially the people and center’s kiosk. 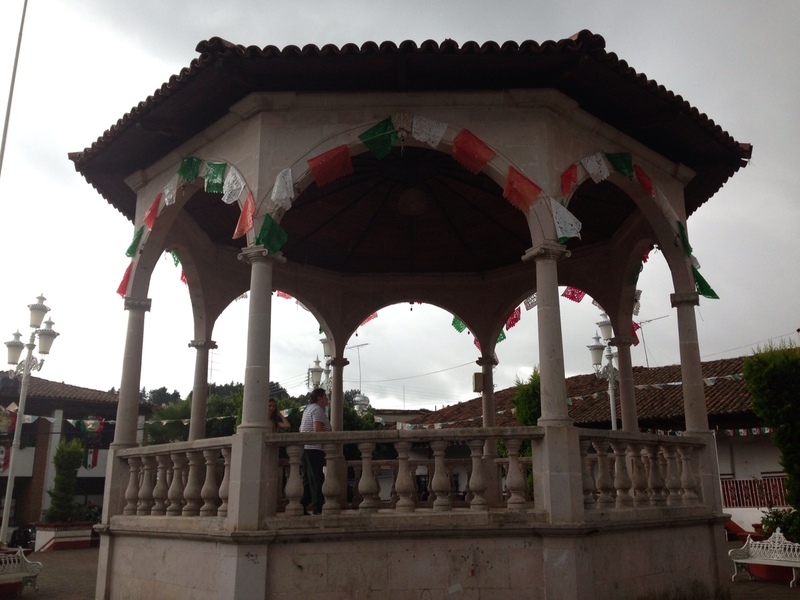 Manzanilla itself is a very tranquil, peaceful town, and many people either spend their weekends running errands in Guadalajara or hangout out, talking, meeting up with friends at the town’s main kiosk. I was one of those people who went to Guadalajara almost every weekend in the beginning, because of a business I was starting selling nursing uniforms. One weekend in particular, on a very warm summer day, I decided to stay in Manzanilla. I was walking around town when I noticed something I had never noticed before. I group of women talking, laughing sitting in chairs inside and just outside the doorway of a house who’s front entrance overlooked the kiosk. Little did I know at the time, this house would become a very important part of my life. As the weeks went by, sometimes I would stay and sometimes I would go to Guadalajara, but every time I stayed I noticed the same crowd sitting, talking, laughing in that same house. Finally, one day, I got up the nerve to investigate and found that these women were knitting and crocheting anything and everything that could be thought up by one’s imagination. Doña Bertha, the owner of the house invited me in, without even knowing who I was. “No, thank you, I don’t know how to knit or crochet,” I said, and without even skipping a beat she replied “I’ll teach you.” And teach me she did. I started to spend more and more time in Doña Bertha’s home, getting to know various women from the town, hearing their stories, talking about their families, their lives, and most importantly I made some incredible friendships. My friendship with Doña Bertha grew and flourished along with my crocheting abilities. This is Doña Bertha who is to blame for the success of all this! She is an incredible human being with a giant heart. 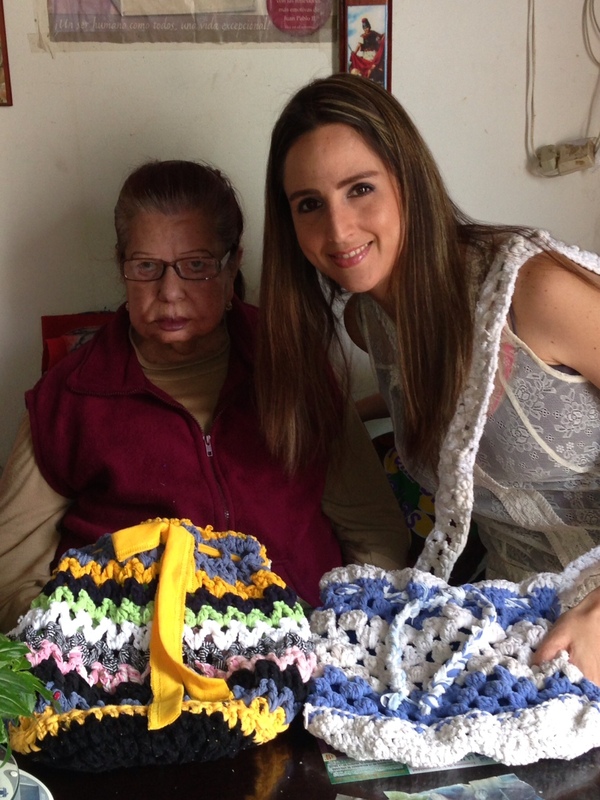 She has taught many people the art of crocheting and knitting (including me), and she is there every day giving herself to the people who want to learn, want to buy or just want to say hello. She handles everything from receiving used materials, distribution, checking the color combinations, and making sure there are no problems from start to finish. During this time, I was also starting my upcycled design business and it occurred to me that I might be able to introduce upcycling to my new friends. When I first approached the group with my idea, some laughed, some just blew me off and some didn’t think it was possible, but Doña Bertha understood exactly what I wanted to do. She inevitably helped me convince all the rest. We spent hours cutting old t-shirts into strips, I showed the women how they could turn the t-shirts into thread, the thickness that each strip needed to be cut into and how they could be woven together. What they provided was their years of experience, the incredible designs and patterns that only existed in their heads and the best company one could ever hope for. This is Evelia. She is the most recent member of our team. She has been crocheting for a long time, but just started working with t-shirts. We went on like this for a little over a year before my husband’s project ended and we decided to move back to the states. At this point, I asked the women if they would like to work for me, helping me make the bags I design, rugs, place-mats and various other pieces that we sell. 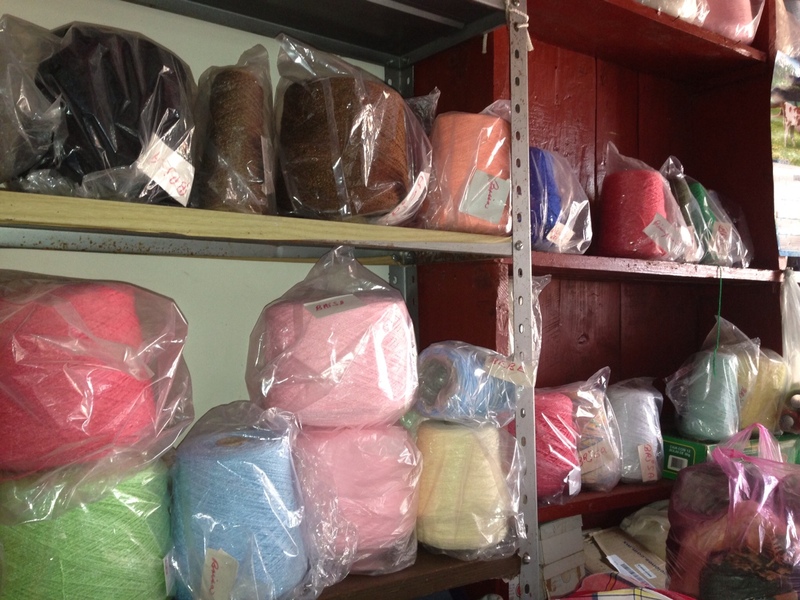 They provide me with the basic raw material and I, with that, create the final products that go out to the customers. This project originally started out to help the single mothers in town. Letting them earn income while they were still able to stay home with their children, but has grown to be much more. Everyone and anyone has become part of our group. We have people working with us that are older, some that are young, some that have never crocheted or knitted before and some that have been doing so all their lives. We welcome anyone who wants to participate and help the environment at the same time! This is Rosa, one of the first that helped me start my project. She actually made the very first ever piece, crocheting while I was still cutting the thread. It was amazing to be there while the very first piece was made! 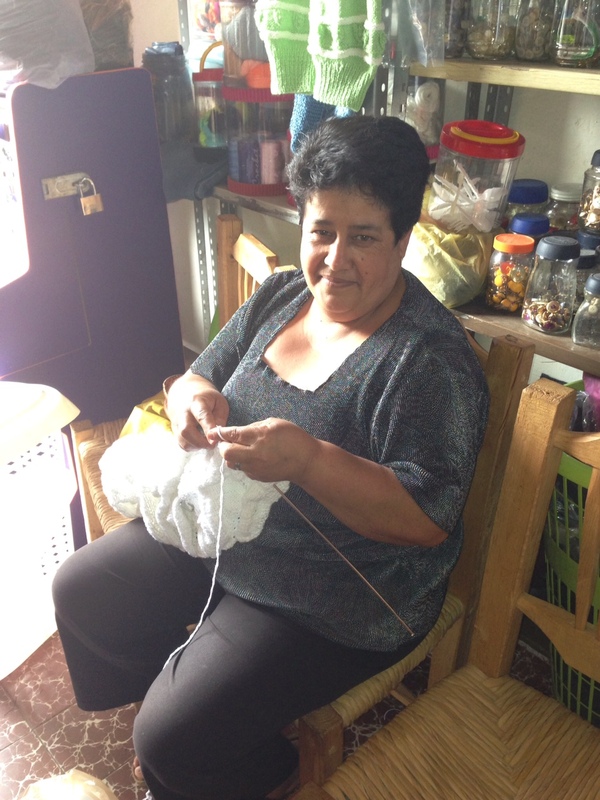 I collect clothing donations from both the United States and Mexico which gets turned into thread that the ladies use for crocheting. 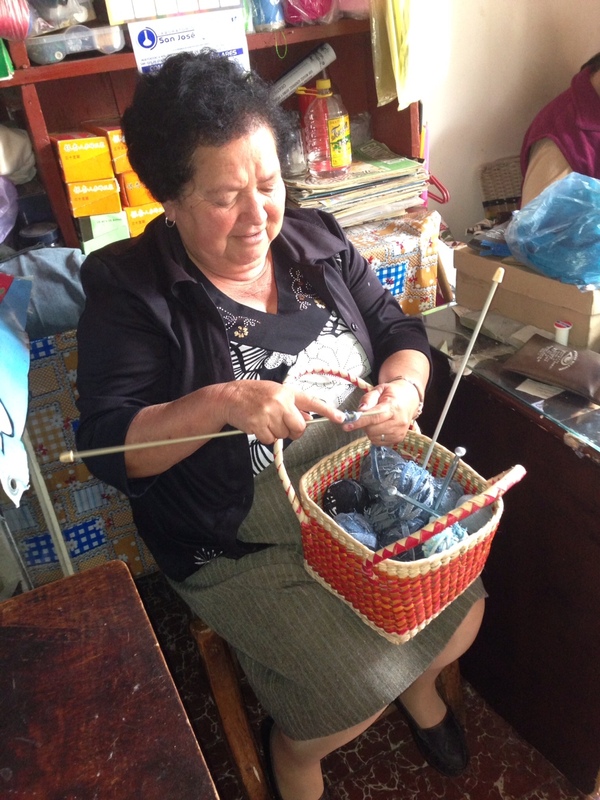 If they receive something that they think is still usable (some clothes still have the original store tags on them and may have never been worn) they give it to people in the community that need it instead of turning it into thread so that nothing goes to waste. If it wasn’t for these women, my business would not be where it is today. They provide me with support, friendship, and help. I would like to say a special thank you to all those women who have helped me out over time with cutting thread, crocheting or both. 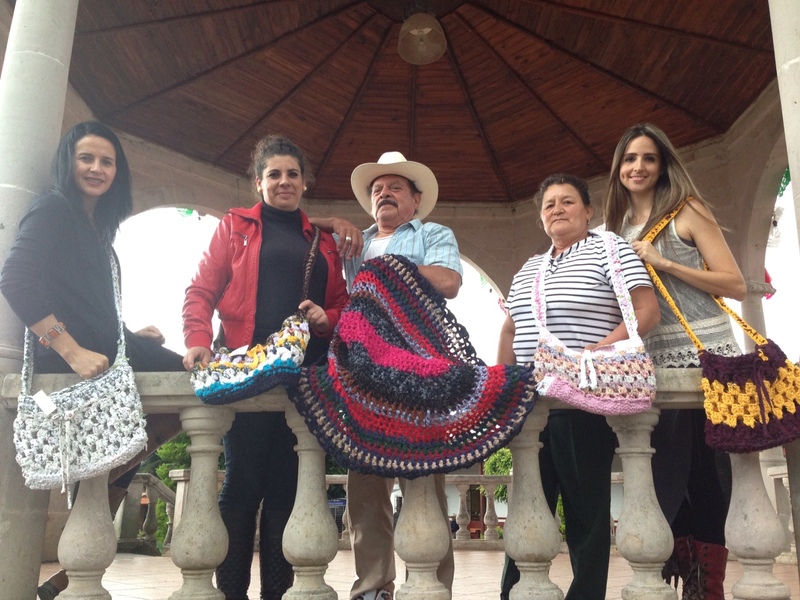 The models from left to right are Elena, Miriam, Don Chuy (Doña Bertha’s husband), Cuco and myself. They are friends who helped me model some of our beautiful up-cycle handcrafted pieces. Not all of them work directly with the project, but they are all a part of it, people who have supported and motivated me from the start. Well, that is my story! Where my idea was born, and I have been working on this project ever since. It has been a struggle at times, like all good things are. Every obstacle has been worth it to bring us to where we are today, and I am positive that our environmentally conscious fashion will continue to grow and grow in popularity! Also, just to let everyone know, the money that is made from the sale of items at the Sofia Encinas Designer Store gets used in different projects worldwide to continue helping people, the community and the environment. More details on the projects that we are supporting will be coming soon! Thank you so much for taking the time to read our story and for sharing this inspiring project! Please share your comments or questions in the comments below, or tell us what it is that inspired you to start a project that you love! This entry was posted in Uncategorized and tagged comments, contributors, Design, eco-friendly, Encinas, fashion, friends, fun, history, Sofia, Sofia Encinas Designer, story, unique, upcycle, upcycling. ← New Products for APRIL ARE HERE!!! Most of my family from my dads side lives in La manzanilla, can’t believe I find an article about it later. Thats awesome! It is a great little town! I still get super excited everytime I go back to visit!